Historic Bibles, LLC began in 2005 when collecting Bible leaves – just the leaves – was already in full swing. 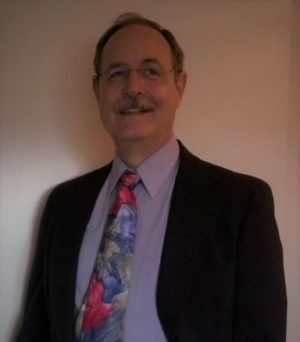 For me as a theologian/scholar (Bruce T. Martin, M.Div. & Ordination ELCA, 1980; Th.D. 1992 diss. “Interreligious Dialogue”), the nightmare situation was that, without proper care, these leaves and manuscripts would simply be thrown out with the trash when the original owner died. What was lacking, I thought, was a way to preserve the leaves from future destruction. To that end, I developed a way to preserve and artfully display the leaves that would ensure their preservation. No one, surely, would dispose of a Bible leaf if it was set in one of my Portfolios or Booklets! I still believe that today. All of the leaves I offer, with the exception of the so-called “Random Leaves,” are set in either a museum-quality Portfolio or an Archival Booklet. All materials used in my Portfolios and Booklets conform to the highest standards for archival preservation as advocated by the Library of Congress. In addition, I have made a special effort to translate important verses into English from the original Latin or Hebrew or Greek, so that the owner of a leaf or manuscript can “read” what is written. One can now purchase an original Latin or Greek leaf with some indication of what that leaf says, and compare it to the Bible they have at home. Since nearly all of the Bible leaves and manuscripts produced prior to 1535 are in Latin, these are now available to English readers with partial translations. Portfolios are classically designed with black linen cloth covers, burgundy silk moire linings, and crystal clear archival sleeves to protect the leaves and manuscripts “for a thousand years” against the outer elements, ink oxidation and rag/paper decomposition. Archival Booklets are made of heavy cambric linen stock, and contain two archival sleeves (same as in the Portfolios) for complete protection of the leaf and COA. Archival tape is used in the binding and as a safe handling strip. Our aim is for a tasteful, artistic, and archival presentation of the leaf, manuscript, or engraving. Medium-sized leaves and manuscripts are set in Bifold Portfolios. Since most Bibles were of this size (about 8″ – 10″ tall), most of our Bible leaves will be found here. Bifold Portfolios come in two sizes, for leaves and manuscripts up to 11″ tall, and for leaves and manuscripts up to 13″ tall. Both are found under Bifold Portfolios. Smaller leaves and manuscripts are set in Trifold Portfolios. Most manuscripts and early Latin Bibles are in this smaller size (about 6″ – 7″ tall), though many early Greek printings are of this size also. 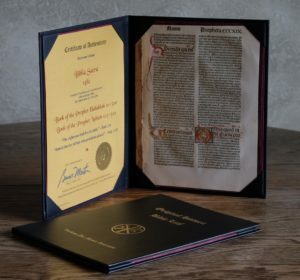 Trifold Portfolios contain (1) the leaf or manuscript, (2) the COA on premium “gold-leaf” paper with gold seal and signature, and (3) a short “History of the Latin/Greek Bible” along with an English translation of some important verses. 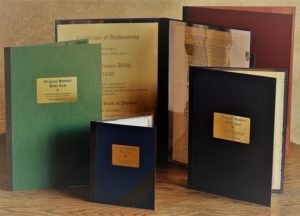 Larger Bible leaves (over 13″ tall) are set in Archival Booklets. 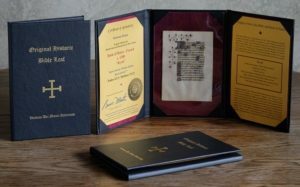 Engravings or engraving sets are sold in either Bifold Portfolios (for engravings up to 14″ x 11″) or in Archival Booklets. About 3,000 years ago, the Creator of the universe spoke to us through words written “by the finger of God” (Deut. 9:10). Prior to printing, the Bible was written by hand, on papyrus or parchment, often taking years to produce a single copy. Despite the cost, Bibles were as artistic as they were exacting, and many stunning illuminated texts survive. With the advent of printing c.1454, the Bible became available to the laity and hastened the Reformation and the Renaissance. To preserve for posterity a rare leaf or manuscript from an historic Bible is thus to be connected to the ongoing creativity of God’s word. From early on, Christians held on to “fragments” of older copies of the Bible, until those fragments were either burned or dissolved into dust; yet still, many early fragments survive to this day in museums or in private collections. Jews, on the other hand, meticulously copied from worn-out copies and then respectfully disposed of the older copies. Either way, the “preservation and presentation of rare historic Bible leaves and manuscripts” is one link in that great chain of witnesses to the God of Abraham, Isaac and Jacob.